Hungry and in need of some quick, tasty, and healthy eats a few nights back, Nicole and I made a quick trip to Dave’s for vittles. It had been predetermined that tacos were our course of action, but the kind of taco had yet to be decided. Unfortunately Dave’s at Cedar and Fairmount doesn’t carry the box of fake taco meat that we really enjoy (especially if you cook the “meat” with beeraritas instead of water!) so we decided on fish tacos instead. 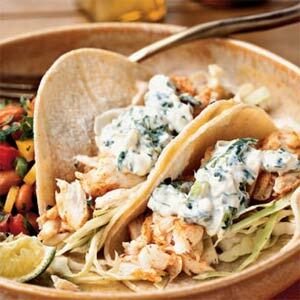 Picking out fish for fish tacos is a tricky feat. On the one hand you want the tacos to taste awesome and that starts with some good fish. On the other hand blowing a bunch of dough on fancy cuts of designer fish is stupid if you’re just going to top the tacos with sour cream, onion, cilantro, hot sauce, etc. A nice middle of the road, mild white fish is ideal for these applications, and really these alone. The tilapia prices were a tad high at Dave’s that night, and I’ve never heard of basa (and after reading this, maybe I’m glad we chose otherwise) so we got a pound of catfish nuggets. Catfish has a clean, mild fishy taste, ideal for lots of cooking applications and it is possible to farm raise cat fish in ways that are both economically and environmentally sound. Catfish nuggets seem to be the ends of fillets and other cuts, not the prettiest pieces of fish I’ve ever seen (there were some free guts attached to ours!) but they would end up working nicely. Our plan was to cut the fish into little bite sized pieces and pan fry them before they met tortilla. In order to impart some flavor and texture to them before they hit the pan I dredged them in cornmeal and chili powder with a little salt and pepper mixed in. I fried them for about a minute on each side in about an eighth of an inch of vegetable oil. In a medium frying pan this took about three batches to get through all the fish. As each batch finished I let them drain on paper towels and hit them with a pinch of salt and a few grinds of pepper. To dress our tacos I finely chopped some onion and cilantro while Nicole made a creama out of sour cream, lime, and cilantro by pureeing the three in a bowl with a stick blender. While all this other cooking was going on we had a black bean side dish simmering on another burner. While there is no defined recipe, this bean dish is something we’ve been tinkering with for a while now. The only real set ingredients are beans, beer, salt, and pepper. To make this we start by draining and rinsing a can of black beans. The beans go into a small sauce pan with a bout 4oz of beer, nothing fancy, usually PBR. The beans then get seasoned with salt and pepper. Since our cooking usually veers towards Mexican a few healthy dashes of Mexican spices go into the beans with some big splashes of hot sauce—Valentina or garlic Cholula—and a good squeeze of lime. If it’s around and/or we remember a clove of garlic is usually crushed and stirred in. Onions are optional before, during, after, or not at all. Cook this all together, stirring occasionally, until the beans soften slightly and most of the beer has cooked away. These are excellent already but can be dressed with hot sauce, sour cream, cilantro, onion, lime or any combination of the above. Once all the fish was cooked and the beans were ready we lightly sautéed tortillas in a small frying pan with a few drops of olive oil to give them a little color and flavor as well as taking the chill of the refrigerator off; a pinch of salt on the tortillas while the oil is still hot is a nice finishing touch. If you’re disinclined towards this method you can always wet a few paper towels and ring them out at thoroughly as possible. Lay the paper towels out and lay the tortillas end to end across the towels. Roll this all up into a loose tube and pop it in the microwave for 15-45 seconds depending on the size and quantity of the tortillas and your microwave. To assemble our fish tacos we made a small bed of creama for the fish to lay in then dropped five or six of the fish bites onto the tortilla. These were topped with a few minced onions and some cilantro along with hot sauce and a pinch of lime. The beans received a dollop of the creama as well, and some more lime and hot sauce. Altogether a simple, delicious meal that we devoured as we watched the fantastic 80’s horror homage House of the Devil. If I had to do it all over again, and I definitely would, instead of seasoning the fish then frying it in oil I would cut the fish and let it marinate in some oil for half an hour or so. I would season the oil with chili powder, cayenne powder, and lime zest. Just before they hit the pan I’d drain the fish bites of excess oil and let them sear in the pan for about two minutes total. While the corn meal I used above gave the fish a bit of texture I think this method would allow the out side of the fish to sear better and develop a bit more flavor. I apologize for only posting drink recipes lately. I must confess I’m not feeling that interested in food these days, not just writing about it, but eating, too. I’ve had very little taste for anything and just eat out of hunger/necessity whatever sounds edible to me at the time (read as: lots of Chinese food). But my current fascination with mixology isn’t terribly troubling to me, so as long as you all are on board let’s take another trip behind the bar for a few new cocktail ideas. In honor of the year’s spookiest month Nicole and I have been watching Twin Peaks, gold edition box-set thank you very much. So far the only thing I haven’t liked about it is waiting twenty years to watch it. It’s a fantastic show that combines humor, mystery, romance, action, the supernatural, and just the right amount of Mayberry wholesomeness in a way that only David Lynch could make palatable, let alone watchable. In addition to being one of the most perfect shows to ever air on network television it’s also one of the most bewildering programs to ever land on network television. 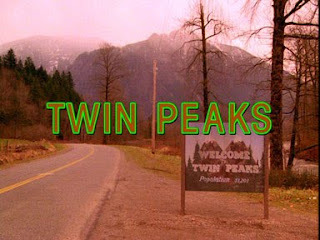 In today’s market of niche programming on both basic and premium it’s easy to imagine Twin Peaks as a sleeper hit on HBO or the mind-melting off season replacement for Mad Men, but in a pre-X-Files 1990/91 television landscape Twin Peaks’ unhinged lunacy was a miraculous pick up for CBS and an even more surprising renewal. But enough about television history, let’s get to the booze! In a second season episode of TP the local bar is transformed into a courthouse during daytime hours to consider the cases of Leland Palmer and Leo Johnson. 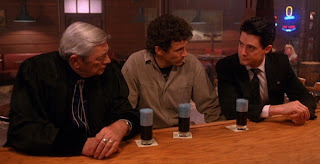 During what seems to be a rough day of court officiating the judge, resplendent in his western ware and robes, pulls our hero, Special Agent Dale Cooper, and town sheriff, Harry S. Truman, a side for a little, ahem, sidebar. The judge discusses Johnson’s case with the two lawmen while his assistant whips up a round of “Black Yukon Sucker Punches.” She hands the men three highballs full of a dark, bluish/purplish liquid which the judge warns will “sneak up on you!” This strange aside in the show and curious looking beverage set me to wondering just what the hell is in it? I’ve been mulling it over for a little while, considering how to get the color right as well as making something that is easily drunk, the judge and Truman knock theirs back in just a few sips. Before I started inventing I thought I’d investigate further to see if anyone on the internet had already invented such a cocktail in homage to this cult classic. I eventually stumbled onto the Twin Peaks Gazette Message Board thread concerning this mythological quaff, but was disappointed by the disgusting and/or thoughtless recipes offered. For example this foul concoction: into a mug pour 11/2 oz of Yukon Jack, fill 3/4 with Hot black coffee, fill the rest of the way with black raspberry liqueur, float 1/2 oz. of Godiva (or Mozart, or the like) chocolate liqueur on top- may substitute with chocolate syrup. Nasty business. Another poster was a little closer with this: Pour 1 shot Yukon Jack, Pour 1 shot Blackberry Brandy, Dash of Bitters, Put in blender with ice, Blend about 5 seconds. Close, but still no cigar. Pour the four liquors into a shaker with ice. Shake vigorously until well combined. Strain into a highball with ice. Top with some “damn fine” Cherry 7-up and float Crème de Casis or Blue Curacao on top. Garnish with a black cherry on an umbrella. No straw. Our hero throughout this epic mindfuck is a quirky special agent from the FBI, one Dale Cooper. 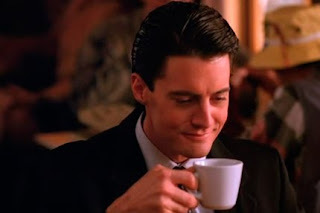 Dale’s seemingly sole purpose in the series, aside from solving the mysterious death of Laura Palmer and rebuffing the advances of Audrey Horne, is the never ending quest for some “damn fine” coffee and pie. While the scientific ability to turn pie into a conveyance of hooch is not quite upon us, liquoring up coffee is well within our means. Combine coffee, kaluha, and vodka in a shaker with ice, shake to combine. Pour ½ to 1oz of the kirshwasser into a coffee mug and swirl to coat the sides, this is easier to do if the liqueur has been chilled redering it somewhat syrupy. Once the mug is coated pour off the rest of the kirshwasser and strain the coffee/liquor combo into the mug. To make it hot skip the shaker and pour the vodka and Kahlua into the cherry flavored mug. Top with hot coffee and stir to combine. Don’t go adding any cream or sugar, Coop takes his coffee black. The cherry liqueur should add just a hint of fruity sweetness to the drink, like a swig of the black stuff after a big bite of some damn fine pie, Cooper’s other weakness. Swap out regular vodka for vanilla and make this a Cooper a la mode! I hope you enjoy these! I’ve got a few more in the pipeline that I’ll hopefully get posted before the end of October. Expect a Bloody Mary variation for Laura, something dangerous and sweet for Audrey, and possibly something completely crazy and dangerous for Bob. Liver Punisher Drink of the Month Club: October Drink of the Month!!! Despite the impending cold and winter we’re about to endure it’s still fall and that means a few amazing things. Topping that list of awesome fall perks are the amazing beers that are released this time of year. Rich, full bodied Oktoberfest beers abound. These big, bold lagers, usually Marzen style, are deep brown or amber in color and are well balanced between sweet and malty, bitter and hoppy, with just a hint of yeastiness. Great Lakes Brewing Company makes one of the best on the market if you’re looking for something nice, but I just finished the last bottle from six pack of Dundee’s Oktoberfest and, man, was it tasty. And at a few bucks cheaper than the GLBC the price is right, too. BUT!!! That’s not what I’m here to talk about today. No, today is about that other fine fall libation your favorite brewery is probably filling the shelves with as we speak. I’m talking, of course, about Pumpkin Ales! Bright, bold beers brewed with pumpkin and spice that warm body and soul even if they’ve just come out of the fridge or the tap. And there’s a huge variety of them out there to try, ranging from the sweet pumpkin pie and vanilla taste of Southern Tier’s Pumpking to the subtler, spicier Ichabod from New Holland; and everywhere in between you’ll find something to suit your tastes. AND!!! Finally we arrive at the subject of October’s Liver Punisher Drink-of-the-Month Club’s October Drink-of-the-Month! Inspired by my love of hearty stouts, delicious pumpkin ales, and a favorite drink of Nicole’s I submit: the Black King! Fill half a pint glass with pumpkin ale. 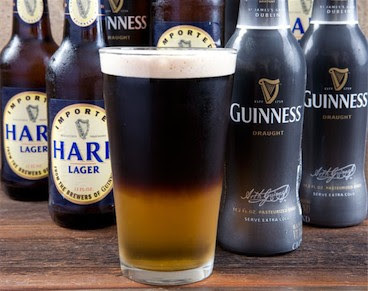 Place the spoon over the opening of the glass and slowly (slowly) pour the Guinness over the back of the spoon—the Guinness in the draught can with the nitrogen widget works best for this. Better yet, head over to your favorite watering hole, one that has both pumpkin ales and Guinness on tap, of course, and have your favorite neighborhood bartender pour it for you! These half-n-half applications always turn out better when draught beer is involved. If all goes well you should have a beautiful half-and-half just waiting to be gulped down. I prefer the Pumpking for this application because of it’s bright, spicy taste, it’s nutty/vanilla aftertaste, and it’s gorgeous orange hue. Dogfish Head’s gnarly Punkin ale or Post Road’s beautifully simple pumpkin ale would also make fine substitutions.